To use Azure AD Authentication, customers must configure an Azure AD administrator who can provision SQL contained users that are mapped to Azure AD identities. 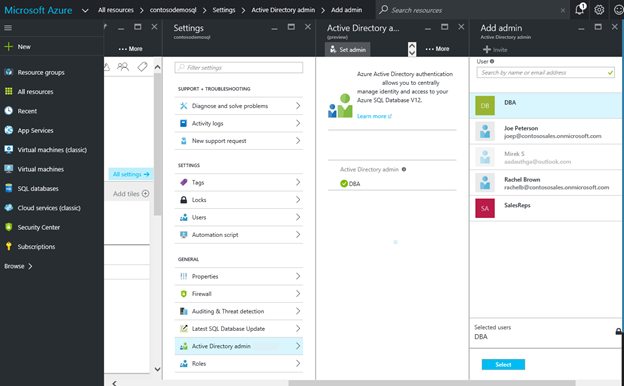 Creating an Azure AD administrator can be done via PowerShell, REST API, or the Azure portal. The screenshot below shows an Azure portal AD administrator DBA representing an Azure AD group with rachelb@contososales.onmicrosoft.com as its member having full server administrative access. 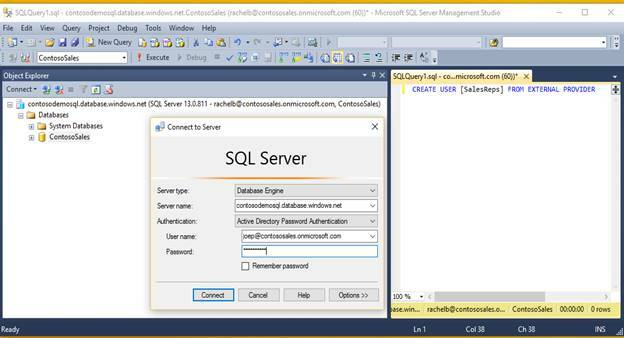 The next screen below shows an Azure AD SQL administrator (rachelb@contososales.onmicrosoft.com) connected to a SQL Database called ContosoSales. The sample T-SQL code in the query window on the right provisions a contained SQL user named SalesReps mapped to an Azure AD group also called SalesReps. As a result, all members of the AD group SalesReps (e.g., user joep@contososales.onmicrosoft.com shown in the connection window) will be able to connect to ContosoSales using their AD credentials (user name and password). Notice the new authentication option in SSMS called “Active Directory Password Authentication”. Azure AD Authentication GitHub Demo - Learn more about Azure AD authentication methods using the demo code samples.